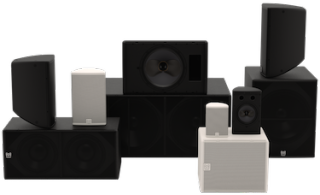 The What: The Martin Audio CDD Series of dedicated installation loudspeakers features six two-way, full-range coaxial systems and high-performance subwoofers. The What Else: Coaxial Differential Dispersion technology delivers more consistent audience coverage than systems with fixed dispersion X° x Y° horns, projecting more output to the rear of the audience to distribute sound evenly from front-to-back, while providing wide horizontal coverage close up. This increased coverage area can reduce the speaker count in larger installations. Molded in rigid UPM Formi—a natural fiber composite that combines stiffness with excellent internal damping properties—the curved shape allows each enclosure to be discreetly mounted close to a wall or ceiling. They can also be used in either horizontal or vertical orientation, with rotation of the coaxial driver easily accomplished by removing the screw-free, protective grille.